I’ve explained on the Home Page and elsewhere that a major broader goal is for this blog to bridge the Stage IV cancer patent and medical scientist worlds to inspire each of them. To share each others’ viewpoints and information on the joint problem of Cancer that they are both fighting from different directions – but unfortunately usually without talking to each other as much as they should. A major fuel which keeps me working so hard on all my numerous writing & advocacy projects, including this blog, is the feedback I get. Feedback of thanks for information, thanks for inspiration, thanks for Hope. That is my favorite word: Hope. I love getting all of that feedback. Letters, emails, family pictures, blog comments, Facebook texts & comments, twitter messages & followers, blog subscribers, the occasional home made & regional physical gifts. Since I started publishing in China (with the help of an entire army of translators shown below! ), I receive numerous WeChat messages and comments written in Chinese too – I truly do appreciate all of them! I know I have touched someone on a very personal & needed level whenever I get even the smallest bit of feedback. It energizes me in both my fight for others & in my fight against my own cancer!. I received something very special in the mail today. I usually can’t share notes of thanks I get, no matter how touching they are, because they are too personal in nature to reprint. 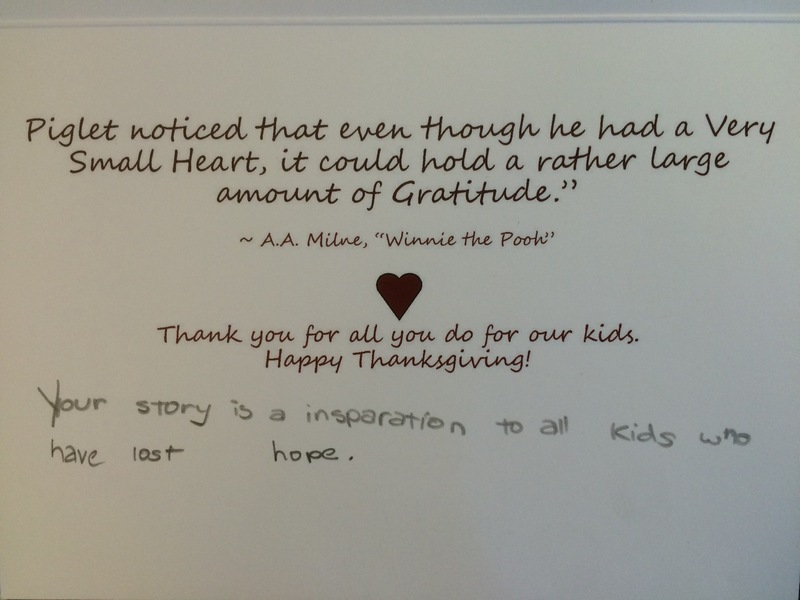 This card I received today was beautiful in both its simplicity and its heartfelt hand written message from a child. It was also written in such a way that I can share it without breaking confidence. 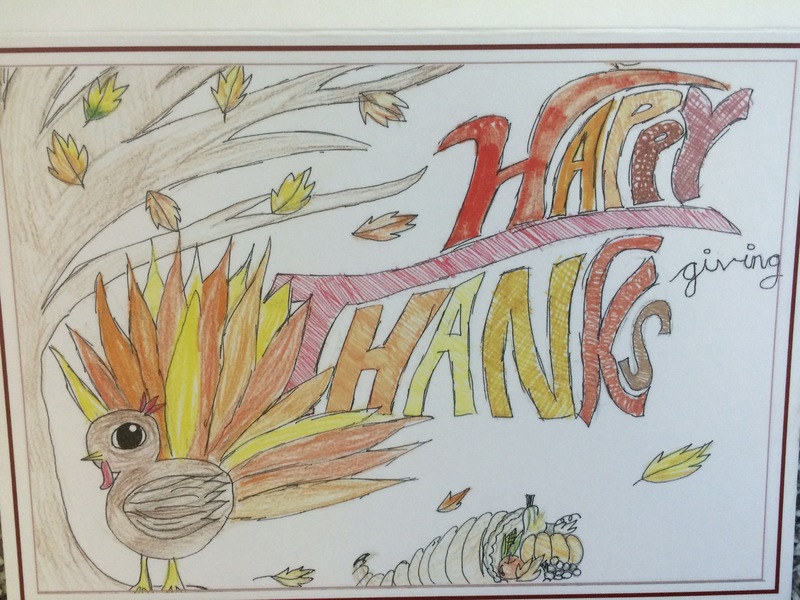 Specific advocacy and blog goals aside, the card I received today from a kid I have never physically met before? That sums up perfectly why I write this blog. To inspire those, kids and otherwise, who have lost Hope. Such a sweet card! Thanks for sharing it! My Husband and I are so thankful for the HOPE that comes from reading your blog! Wishing you and your family continued joy, peace, and HOPE, at this magical and holy time of the year! I likewise have the same wished for you, especially during this time of year. I am glad you get something helpful and meaningful from my blog. Thank you for reading and your nice comment! Your blog *does * inspire HOPE. I’m running out of options for my Stage IV KRAS-Mutant/MSS colon cancer (wouldn’t have known about MSI/MSS without your blog), and though I feel sadness, there are also moments of soaring joy because people like you are working so incredibly hard to find those magic bullets we need. May God bless you and your family richly in this season of Advent, the season of watching and waiting. Thank you Sarah – I’m not sure if you saw my posts on FB or Twitter yesterday (I always use “public setting” there for CRC posts) but there was a huge CRC-immunotherapy expert roundtable convened yesterday to bring together many of the greatest scientists in those fields to discuss data and ideas for MSS patients like you and I. Scientists are working very hard on MSS-CRC! I will do a full blog on the meeting and once published any MSS signs of success ASAP on both my Fight CRC science column and on this blog! The immunotherapy wave continues to rise, hold on! This is a very heart touching blog, thank you for sharing it, and letting your readers reflect on the beautiful simplicity of the message, HOPE. Blessings to you and your family. I’d be six months behind what I’ve learned from you, Tom, if I hadn’t somehow, and I don’t remember how now, found you. So mich appreciation and love, Tom, from me to yoou….have a great Advent! Tom, if hadn’t inadvertently stumbled across your blog, I’d be half blind still. What you do is so very appreciated. My admiration and brotherly love to you during this Advent. Thanks for both comments Nat – likewise I am glad you found inspiration & information – and that we have been able to meet & become friends this year! To Life Brother!